A YEAR ago we saw a real demonstration of democracy in our electorate, as Cathy McGowan defeated the sitting member with the help of a strong preferential vote. At the same time as this was happening, plans by the “Western allies” for violent change of government in Syria following the criminal fabrication of a chemical weapons attack on Damascus were effectively thwarted by skilled Russian diplomacy. Despite the clear and convincing evidence that the Sarin attack was staged and effected by foreign intelligence agencies working with terrorist groups, to be used as a pretext for “humanitarian intervention”, this fabrication and other false allegations against the Syrian government are now being dusted off again, along with a suitable replacement “government in waiting”. Despite the atrocious problems and continued fighting in some areas of Syria, 73 per cent of eligible voters cast their votes. Even refugees participated, with more than 100,000 voting in Lebanon. Unfortunately for the West’s ambitions, Syrians overwhelmingly supported their current president Bashar al Assad; the two opposition candidates received only 7 per cent of the vote. 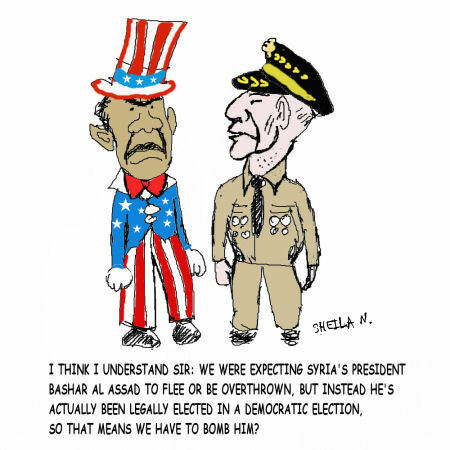 Though declared free and fair by international observers, the election was hypocritically described as “illegal” by the US and Australia, and this is now being used as a justification for breaching Syria’s sovereignty without UN approval. As we have now tacitly acknowledged the truth of President Assad’s claim that he was fighting “foreign terrorists”, isn’t it time to also acknowledge the democratically expressed will of the Syrian people, and time to abandon the preposterous idea that the cabal of Western and Gulf-state backed puppets we recognise as “legitimate representatives of the Syrian people” has no legitimacy whatsoever among those very people? Past harsh rule seen as necessary for survival of Syrian state? This is to be posted to johnquiggin.com . "[The Syrian Christian] explained to me that Assad's foot on the throat of all warring ethnicities was the best rule the place could have. ... Sometimes a dictatorship is better than the alternative. The colonial boundaries imposed geopolitical proximity to warring ethnicities, religions and factions thereof." I suggest that that more accurately describes the rule of President Hafez al-Assad (1930-2000) than that of his son, Bashar. To me, it seems plausible that, in the circumstances faced by Hafez al-Assad, he may have felt that he had no choice but to resort to very harsh measures in order to stay in power, prevent invasion and prevent ethnic strife. The video broadcaster known as The Syrian Girl, who, in 2014, is an outspoken supporter of Syria, actually fled from Syria with her family to escape persecution. So, presumably, even many loyal Syrians suffered unfairly at the hands of President Hafez al-Assad. Bashar al-Assad (born 1965), who trained in London as an ophthalmologist, has a somewhat different style to his father. Whilst he has show himself to be just as capable as his father of making the harsh decisions necessary for the survival of the Syrian state, he has also shown himself capable of governing Syria in a way that is remarkably free and open in the face of a bloody terrorist war. On 4 June 2014 at an election which was certified as free and fair by a large number of international observers, he was elected by a huge majority of Syrian voters. according to Wikipedia, 88.7% of the 73.42% of eligible Syrian voters who were able to vote amid the war and chaos, voted for President Bashar al-Assad. What leader of any of the Western countries hostile to Syria can claim anywhere near as much support? Sadly this story has largely been hidden from most Australians by the lying newsmedia.